The Google Pixel 2 and Google Pixel 2 XL should be put in cases because of their top-tier price alone, but at least Google bucked the trend of recent flagships using tons of glass in the design. The Google Pixel 2 and Pixel 2 XL both have partially metal backs. If you like the dual-tone design of your Pixel 2 or Pixel 2 XL, there are clear cases that’ll let you keep showing off the style. 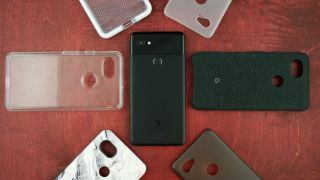 On the other hand, if your favorite part about the phones is their performance, cameras, and access to plenty of Android updates, then you’ll enjoy a great Pixel 2 case that can keep your phone safe from damage for years to come. Whichever type of Pixel 2 or Pixel 2 XL case you’re looking for, we’ve got a recommendation that will fit. While we’ve personally used most of the following cases, some of these options are untested. Nevertheless, we’re confident that each entry is a cut above the rest due to their value and design. There's a more affordable ultra-thin case that we recommend from MNML. Available in multiple colors for both Pixel 2 sizes, these cases fit Google's phone nice and snug. Despite its good looks, it’s not a case that you want to put through much turmoil. It prevents micro-scratches, but it likely won’t prevent damage from a drop, and in the case of the Pixel 2 XL, its curved glass isn’t protected in the slightest. These are cheap enough that you can buy multiple colors to suit your outfit or mood. It's surprisingly hard to find a Pixel 2 case that adds some wild flair, but Incipio's fits the bill, but for more than just being vibrant. At its affordable asking price, it cradles Google's phone real close – even providing a lip over the screen to prevent scratches or cracks from accidentally sliding it on the table face-first. Let's be honest, the best thing about this case is that it just looks nice. Most of us here consider the Pixel 2 to be a good-looking phone, but if you've got to protect it, you might as well add some style. Google’s own case for Pixel 2 and Pixel 2 XL does well at maintaining the slim look and feel of the phones. Unlike the other options on this list, this one adds microfiber material to the list, giving it a classy look that enhances the grippiness in hand. We like this case for several reasons. Its price is tolerable, it’s available in a few different colors (Carbon is pictured, but Cement, Midnight and Coral are for sale) and it makes all of the Pixel 2’s features easily accessible. The buttons are effortless to push, making it feel like there’s no case on at all. It also raises the phone’s front so that the glass display isn’t grazing any surfaces. The only downside in our experience is that fuzz from your pocket gets into the grooves near the screen. Simply wiping it away cleans things up, but it’s annoying to have to do that each and every time you pull it out. Also, the bottom of the phone near the charging port isn’t protected on the front, which subjects it to scratching. This one's currently available on Amazon in a few different color varieties, but if you can't find it, head to the links below. See the cases's two layers? It should be no surprise that Google’s cases don’t fuss with their phones’ design too much. The Live Case is a more durable option over the Fabric Case, giving it two levels of protection. To pop it on, there’s a silicon case that’s protected by a tough shell that has the design of your choice on it. Every angle of the Pixel 2 is protected here, including the camera and screen. The buttons feel nice to press and better yet, the Live Case functionality is interesting. Your phone's wallpaper can match the look of the case by downloading the Live Case app and putting in the code that's printed on its inside. Removing and reapplying the Live Case takes a bit of practice, though we never felt like it was close to breaking. All in all, this case is best if making something custom is a high-priority for you. You should be able to find a nice variety of pre-designed Live Cases on discount through Amazon, but should you want to customize, head to the links below. While not the most rugged case in its design, the Evo Check case by Tech21 is taking us into options that add a fair amount of bulk to the Pixel 2. This case fits the Pixel 2 snugly, adding on the company’s FlexShock barrier to make it drop-friendly from distances up to 10 feet. Overall, it strikes a nice balance between form and function, showing off the Pixel 2’s design highlights while making sure to protect it from all sides. Google’s cases on this list provide better button feedback. Here, the phone’s buttons felt a little too difficult to push in, though it’s possible that they might loosen up over time. But we’re a fan of this case’s added grip factor and the mesh design. This clear case from Speck is durable, yet simplistic in design – an impressive feat given how robust of a protector it is. If you’re after a rugged case that has hints of a slimline look and feel, this is one to look out for. Once the Pixel 2 is slid into the Presidio Clear, it’s protected from dropping from up to eight feet. Sure, it’s less than the 10 feet guaranteed by Tech21’s option, but Speck’s case shows off the design of the phone a bit better. Some complain that this case makes holding the phone a more slippery affair, however, we haven't noticed this yet in our testing. This sort of thing certainly depends on how oily the case becomes, either through body oils or from touching it after eating. The low-profile build of a slimline case combined with a textured rim and bumper-packed corners describes the look and feel of the Incipio Reprieve Sport 2.0. It's not the cheapest case around, but unlike slimmer options, this one will offer protection from every angle without masking the Pixel 2's look. We always appreciate when a rugged case yields responsive buttons and easy access to ports, and to that end, this one is worth checking out in your favorite color. Google has partnered up with Bellroy as one of its premium 'Made for Google' providers, and the fruits are stunning. The Bellroy Leather case comes in a variety of color options for both the Pixel 2 and Pixel 2 XL, and doesn't really cost as much you might think. The leather on its back is supple and smooth, transitioning into matte plastic running around the trim of your device. Bellroy's case doesn't provide button extenders, but pushing them in doesn't require any additional effort. This case gives off a really high-end look and those looking to suit the Pixel 2 up as nice as you dress yourself, you'll be pleased with Bellroy's latest. There's something that your Pixel 2 or Pixel 2 XL is missing. It's wood, yep wood. Kerf makes its own phone cases by hand, complete with a flattering design, and backs it with a lifetime warranty. Not just any regular wooden case would impress us, but this one – even at the low-end $69 walnut option – is a top option if you want to protect your Pixel 2. The buttons are responsive, the suede inside cradles the form factor perfectly and heck, it just smells good. When have you ever bought a case that you enjoy smelling? Whether or not you want to show off your Pixel 2 or Pixel 2 XL's two-tone finish, you've got a good and affordable option in the Otterbox Symmetry series of cases. The Symmetry case adds cushion around the back and sides of your Pixel 2 while also raising the edges above the level of the screen, so you can drop your phone flat on the ground and the screen won't make contact. The design is simple, and there are both opaque and see-through options, so you can hide the Pixel 2's style, or you can leave it showing. If you like changing up cases, this is also an easy one to take on and off. Spigen's Neo Hybrid Herringbone series of cases offers nice, two-part protection for the Pixel 2 and Pixel 2 XL. At the same time, it adds its own two-tone design. The soft shock-absorbing TPU layer has a herringbone pattern and it's one color, while the harder PC bumper frame gives the case a second color. So, even though you're covering up your Pixel 2's design, you'll still be keeping that two-tone aesthetic. And, on top of giving your phone new look, you'll be ensuring your Pixel 2 or Pixel 2 XL doesn't end up with a broken look from a simple fall. Spigen claims the case offers military-grade drop protection. All the more impressive is that the price is still low.